I adapted this piece of information from the book,Traditions and customs(Reethi Rivaaz) by Smt Rama Bai. Most of us,GSB’s, own this book and we refer it as and when needed.My Amma had given me this book after my marriage.Though we do not follow this exactly this is how it is.I give full credit to the author of this book especially I’m a Novice when it comes to all this.Today I was searching one of my recipe book and I found this in the pile.Most important is I share my birthday on this auspicious day,infact I was born on the same day that year ( year is Secret). After my wedding I celebrated my first new year on March 20th itself,happiest moment of my life.Well we celebrate by cooking the Yugadi menu,pray to God(we do it daily too),and have Behu Bella which our priest comes and gives us,that’s it.The below information is the traditional method.The date is not same every year.This year it falls on 11/04/2013.Happy Yugadi dear friends!Thanks for all the support. Yuga means years,”Adi” means start.The first day of every year is called “Yugadi”.From this day onwards Chaitra Vaishaka spring season starts.This is called spring month(Vasanth masa).During this day serving ceremony to sari(Kappada vadapa) is celebrated.Means serving two new saree’s(brought to wear) to the elder women of the family who are no more. (Some celebrate this ceremony in the month of “Shravana” on the day of thread ceremony. Way of performance:Wash a wooden seat(Manai),draw Rangavalli on it and keep the two new sarees over it with their ends facing over side(Blouse piece is also kept).Over the saree place a clean paper or a piece of banana leaf and keep vermilion case,Soot case(Kajal or Kajla kardo),flower,”Akshate”(white rice),Betel leaf with the nut(Vido-1 no),lighted lamp to be kept on the right side of the wooden seat.Serve cooking of the day on the banana leaf(Sweet soup(godshe),pudding,white rice,ghee,curd).Pray and remember with devotion the elders of the family who are no more and then let the head of the family wave lamp(Aarathi) 5 times and put Akshatha on the wooden seat,and again wave the lamp and have circumambulation and all salute.Then shake the wooden seat little bit. (It means give up). Dishes of the day:Black chana ghashi with raw jackfruit or yam, tender cashewnut (Bibbe) upkari,Kadgi chakko,Ripe mango curry,Dhali thoy,Madgane(Sweet dish),Godi randai(sweet curry),Rasavode etc.I will post the dish one by one as I prepare. Vaisu:Vaisu means,on a piece of Banana leaf serving white rice,sweet soup,ghee and after saying “KRISHNARPANA”(offering to Lord Krishna) keeping the banana leaf outside the house for the cows. GOGRASU:Take a piece of Banana leaf,serve white rice,sweet soup and feed it to the cows without adding ghee.Before starting meal,read Hindu almanac,eat Morgosa Leaf(Bevu),with Bella(jaggery) mixture.It means face and treat every difficulties equally in life.The head of the family(man) to sit for meal holding the sarees on his right lap and give them to his wife.His wife should give flower, vermilion,soot to other female member of the family,offer a thread of that new saree to God,and a little piece of it to burn and offer it to “Tulasi Mata” is a custom.In the evening go to temple and offer prayers to God and get blessings. 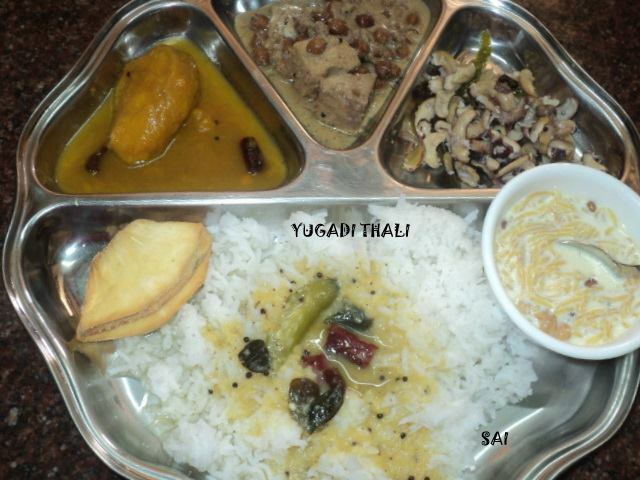 From the day of Yugadi,spring month starts.In the temples,perform “Vasantha Pooja” or “PANVAR POOJA”.Offer food to the God like fruits of the new year like Mango,jackfruit,Cashew fruit,Bengal gram upkari,green gram usli,Panaka etc and distribute to the devotees as Prasadam.It is also called “PANAKA POOJA”.Some celebrate this at their homes. Hi thanks for the wonderful info.I too would like to have the book.Where can I get it from? I am goin to Udipi and Goa in May.Will I get it there? I love your blog, your presentation, write up and food; nothing more to say. Keep up the good work and post some more authentic receipes.